Ricky Swallow: The Bricoleur. There, I've written it now, in all its dated cultural studies glory. 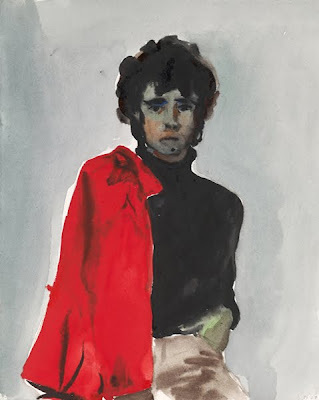 Melbourne's NGV presents us with an exhibition of a young artist's career with a title that tries so hard to give us an intellectual justification it almost begs interrogation. 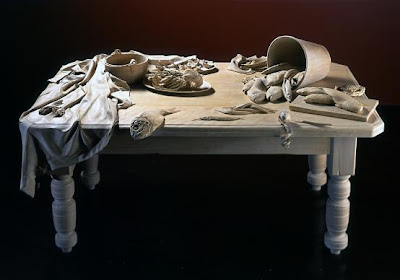 Ricky Swallow is an artist, now based in California, whose works span sculptures (often in wood) of everyday objects treated monumentally or hinting at familiar art-historical themes and watercolours that borrow heavily from Picasso for style and Sixties and Seventies pop culture for subject. Despite the title bricolage is a practice rather than a position, the show could more accurately have been called "Ricky Swallow: The Pasticheur". Some Swallow's works are profoundly good. His sculpture 'The Man from Encinitas' seems at once a death mask and gloriously alive. The white plaster is a virtual fingerprint of artist and subject, the ripples and scrapes from the sculptor's hand give it a sense of potential at rest that is dignified and graceful. Much of the problem here is that whilst some works are astounding others are so breathtakingly pointless that they make you wince. The series of watercolours that Swallow produces are really art school pastiche. They appear like sketches, like a conceptual artist having his cake and eating it saying "see, I can paint, but it doesn't matter". Swallow disingenuously presents himself as nothing more than a hobbyist, as if playing down the artfulness of his craft absolves him of anything as tedious as traditional artistic production. Like a smart kid at school embarrassed to look clever in front of his peers. It's a cheap and unnecessary trick. Swallow is much more than a hack sculptor. He has a beautiful control of finish, at exactly the right times and places he chooses the hyper-realistic smoothness or a more fluid expressionistic effect where chisel marks speak in the wood. When he juxtaposes mass and lightness he might not be breaking new ground but he has a sure and delicate touch. Swallow is at his best when he's human. 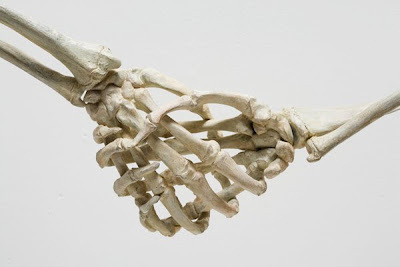 In 'Unbroken Ways (for Derek Bailey)' a disembodied arm that dangles like those in a pieta meditates on the fragility of flesh so eloquently that the back story it is given is unneeded. 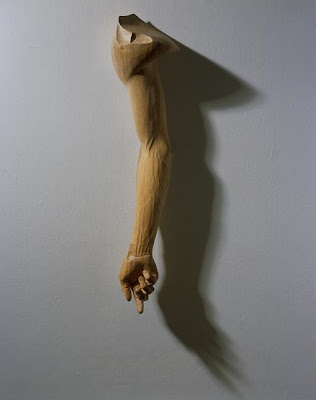 If wood can communicate the fragility and life of flesh then single entendre titles are a distraction. Swallow is at his best when he's exploring ways to communicate through the innate qualities of materials. Thus a black power fist struggles and emerges from a log in 'History Holding' speaking more eloquently about the artistic potential than any artist's statement. Similarly in 'Caravan' a highly formal piece in which cast bronze balloons are speckled with angry insistent barnacles Swallow reminds us of the point of the object. This is always going to be more affecting than glib post-modernism, but he just can't help himself sometimes. So my deep dislike for portentous and ironic titles bristled up immediately here. 'Salad Days' and 'Killing Time' are only two of the jokey puns, the problem is that art that simply supports two meanings isn't very smart or complex. There's no room for subtext. Irony is not the complex and neutral form that ambiguity is. It doesn't invite engagement or interpretation. Art ought to aspire to infinite meanings, or maybe even only one. Irony doesn't make for good art, when irony is the defense mechanism against meaning, masking an anxiety about sincerity. 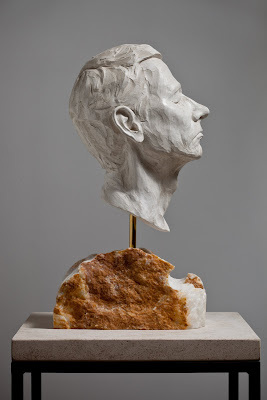 I wonder if Ricky Swallow feels being a genuinely powerful sculptor isn't art world cool enough, that it needs an arch and shallow patina for it to be critically proper. Perhaps Swallow's funereal imagery is his way of burying himself as an artist beneath a pall of secondhand references, or maybe the sombre intimations of mortality are supposed to make the punchlines funnier. It's a shame either way.